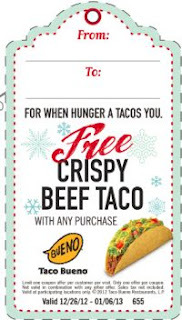 Taco Bueno is one of my favorite fast food Mexican Food places. They make their beans, Fresh Pico de gallo & Guacamole fresh everyday. I love the white lime cilantro white rice in their Bueno Bowl too, it's so good! They are offering free printable coupon tags for Christmas! I love the light blue with red color that they made them. Print off the coupon gift tags and add them to gifts! This is a great idea. The coupons are valid 12/26/12-1/6/13. Go to their Facebook page & like them. Then you can print the coupon gift tags very cute idea!